Snoring is the sound of vibration caused by the respiratory structures due to obstructed air movement during breathing, while a person is asleep. In some cases, the sound may be mild, but in other cases, it can be loud and irritating to the listener. Snoring is the sound of vibration caused by the respiratory structures due to obstructed air movement during breathing, while a person is asleep. In some cases, the sound may be mild, but in other cases, it can be loud and irritating to the listener. Snoring while sleeping may a preliminary sign, or first alarm, of obstructive sleep apnea (OSA). 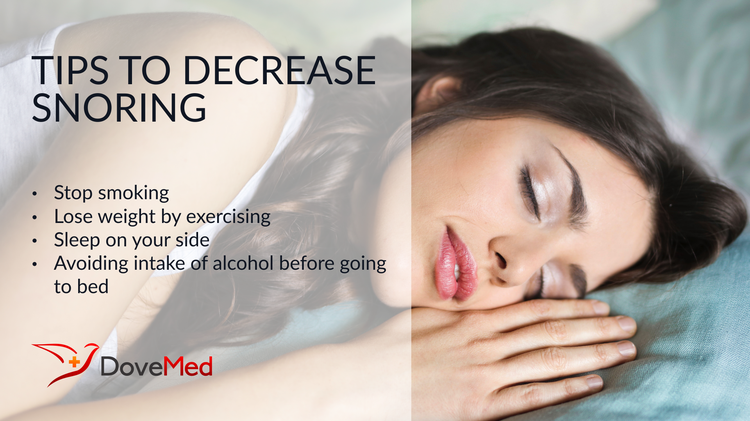 Snoring might also be an outcome of sleep deprivation. Continuous positive airway pressure (CPAP): It is a pump that is a connected to a mask and has to be worn at night in order to keep the airways open. There are other types of masks too. In some cases, surgeries can be helpful and may be used to take care of snoring. Radiofrequency ablation (RFA) is a surgical treatment used to treat snoring. In this treatment radio frequency energy and heat (between 77 to 85 degree Celsius) is applied to soft tissue present at the back of the throat, such as soft palate and uvula, causing a scar to the tissue beneath the skin. The treated area on healing gets stiff. This procedure requires a few treatment sessions. RFA has been found effective in reducing the severity of snoring as has been discussed by Ruthann Ritcher in a Stanford Report in 1998. Playing didgeridoo might sound strange, but studies show that learning to play didgeridoo (a native Australian wind instrument) has the ability of strengthening the soft palate and throat, thereby reducing snoring incidences. A study conducted at the University of Zurich in Switzerland has shown that how the participants who played this particular instrument slept better and complained less as compared to participants who did not. Snoring is condition that can either be cured or treated in an effective manner. Several treatment methods and remedies are available to help the snorers. Friedman, M., Schalch, P., Lin, H. C., Kakodkar, K. A., Joseph, N. J., & Mazloom, N. (2008). Palatal implants for the treatment of snoring and obstructive sleep apnea/hypopnea syndrome. Otolaryngology–Head and Neck Surgery, 138(2), 209-216. Brietzke, S. E., & Mair, E. A. (2001). Injection snoreplasty: how to treat snoring without all the pain and expense. Otolaryngology—Head and Neck Surgery, 124(5), 503-510. Pavelec, V., & Polenik, P. (2006). Use of Er, Cr: YSGG versus standard lasers in laser assisted uvulopalatoplasty for treatment of snoring. The Laryngoscope, 116(8), 1512-1516. Rich, J., Raviv, A., Raviv, N., & Brietzke, S. E. (2011). An epidemiologic study of snoring and all-cause mortality. Otolaryngology--Head and Neck Surgery, 145(2), 341-346. Koutsourelakis, I., Keliris, A., Minaritzoglou, A., & Zakynthinos, S. (2015). Nasal steroids in snorers can decrease snoring frequency: a randomized placebo‐controlled crossover trial. Journal of sleep research, 24(2), 160-166. Petruson, B. (1995). Dilation of the nostrils can decrease snoring and improve sleep apnea. In Rhinology: A State of the Art: Proceedings of the XVth Congress of the European Rhinologic Society and the XIIIth International Symposium on Infection and Allergy of the Nose, Copenhagen, Denmark, June 19-23, 1994 (p. 253). Kugler Publications. Koutsourelakis, I., Lamprou, K., Perraki, E., Vagiakis, E., & Zakynthinos, S. (2014). Nasal steroids in snorers can decrease snoring frequency–A randomized placebo-controlled crossover trial. European Respiratory Journal, 44(Suppl 58), P4918.